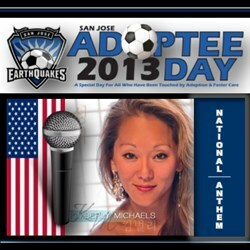 I am so excited to come out to the San Francisco Bay area and have the opportunity to sing the national anthem for the San Jose Earthquakes Adoptee Day - I look forward to meeting everyone very soon...Go Earthquakes! The Mixed Roots Foundation proudly announces its community partners for its final game of the second season of its signature Adoptee Day / Night sporting events and will feature back by popular demand Korean adoptee artist and singer Kimberly Michaels who is based in Minneapolis, MN and recently performed the national anthem with the Grammy Award Winning R&B gospel group Sounds of Blackness for the inaugural Adoptee Night with the MN Twins in August 2013. Kimberly will sing the national anthem for the first ever MLS San Jose Earthquakes Adoptee Day where they take on FC Dallas on Saturday, October, 26, 2013 – 2:30 p.m. at Buck Shaw Stadium, Santa Clara, CA. The San Jose Earthquakes in partnership with Mixed Roots Foundation will donate a portion of all signature Adoptee Day tickets sold to benefit local community partners whose vision and mission align with providing more important post-adoption resources for adoptees and their families. Special pregame activities include a VIP reception, silent auction and for a limited number of VIP guests – an opportunity to go out on the field to meet & greet the Earthquakes players. All Adoptee Day ticket holders will receive a free signature Adoptee Day rally towel. Tickets are now on sale - For more information, details on the event and/or to buy tickets for groups 10 or more to avoid Eventbrite service fees, please contact Matt Chan at the San Jose Earthquakes at 408.556.7711 or email mchan(at)sjearthquakes(dot)com. You may also visit http://earthquakesadopteeday.eventbrite.com/ to buy tickets online. To sponsor, volunteer, or learn more about Mixed Roots Foundation and its partners, programs and events, please LIKE Mixed Roots Foundation on Facebook, call 800.659.6958, email events(at)mixedrootsfoundation(dot)org, or visit http://www.mixedrootsfoundation.org. To donate, please text ADOPTEES to 56512 on your mobile phone.